• For quantitative determination of pyruvate and evaluation of drug effects on its metabolism. • Pyruvate is a key intermediate in cellular metabolic pathways. Pyruvate can be converted to carbohydrates via gluconeogenesis, to fatty acids or energy through acetyl-CoA, to the amino acid alanine and to ethanol. Abnormal levels of pyruvate have been linked to liver diseases and metabolic disorders. Simple, direct and automation-ready procedures for measuring pyruvate concentrations find wide applications in research and drug discovery. 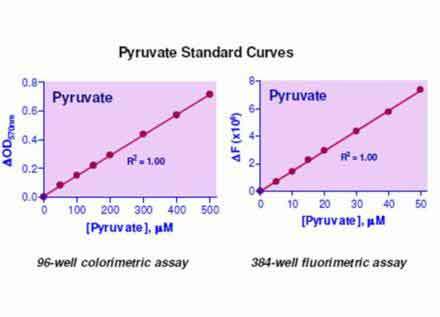 BioAssay Systems pyruvate assay uses a single Working Reagent that combines pyruvate oxidase and hydrogen peroxide determination in one step. The color intensity of the reaction product at 570nm or fluorescence intensity at λex/em = 530/585nm is directly proportional to pyruvate concentration in the sample. 1. I would like to use the EnzyChrom pyruvate assay kit (EYPR-100) to determine pyruvate levels in cell culture medium containing phenol red and fetal bovine serum. Does this interfere in any way with the measurement? Phenol red adds a background to the OD measurement that will vary with the pH of the medium. Pyruvate in FBS will also add a background to the measurement. In order to correct for those interferences you should add a separate control with unused medium +FBS and subtract that from all sample values or, you could also prepare the standard in the medium + FBS. To play it safe. Alternatively you can use serum-free medium without phenol red.